The epping motor company is a family owned and run business established in the mid 1960’s in Ilford by Rodney Lyons, who still runs it with his eldest son Brett, and assisted by Scott and other members of the Lyons family when needed. We have always had a reputation for selling an interesting mix of old and new cars, including brand new Shelby Mustangs in the 1960’s, Mercedes 300SL Gullwing's for £900 (those were the days! 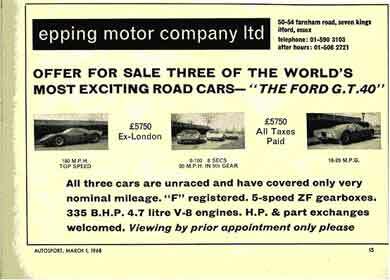 ), and once owned 3 road-going Ford GT40’s at the same time (see our 1968 advert reproduced below). Our main showroom was based in Ilford High Road from 1971 to 2002 when we relocated to near Ongar in Essex, giving customers an easily accessible but far more relaxed situation for viewing.